After years of disasters, droughts, fires, storms, and war, the United States has long been replaced by Panem, a country divided between the Capitol and the twelve districts it oversees. There were once thirteen districts, but all were defeated when they tried to overthrow the Capitol and one district was destroyed. To continue to showcase their power over the remaining districts, every year the Capitol requires them to supply two kids, between the ages of twelve and eighteen, for televised, fight-to-the-death matches called the Hunger Games. This is sixteen-year-old Katniss Everdeen’s world. A member of District 12, Katniss has lived under the cruel dictatorship of the Capitol her whole life. Secluded from other districts and starving, after her father dies Katniss does whatever she can to put food on the table, even illegally sneaking under the district fence to hunt for food in the nearby woods. Little does she realize, this hunting skill will serve Katniss well when she has to defend herself in the games. 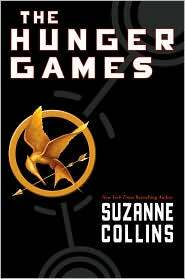 I loved The Hunger Games, book one in a three-part young adult series, by Suzanne Collins. For a year people have been telling me to read this book and I’m annoyed it took me so long to pick it up. It’s no Pulitzer Prize winner, but it’s a damn good time. First of all, and most importantly, I love Katniss. She’s a brave, smart, and witty teenage girl, a fabulous alternative to the stupid, whiny, and wimpy Bella (don’t even get me started on the awfulness that is Twilight). Katniss is the hero we all love to follow. She’s had a hard life, but after her father died and her mother checked out, it was either allow her sister and herself to die or do whatever possible to survive. It’s not hard to love her instantly, especially when she bravely takes her sister’s place in the Hunger Games. The crazy Hunger Games also kept me reading until the early morning hours. Kids, some training their whole lives, some without any hope, make alliances, turn into killers, and contemplate why and how things got to this level, while all they say and do is filmed and shown to the whole country. It’s fast-paced, captivating, and dramatic, making it hard to bookmark your page and walk away. There’s also a bit of romance in The Hunger Games, with Katniss’s counterpart from District 12, Peeta Mellark, the son of a baker, who isn’t much of a fighter or hunter. His best skill is picking up and throwing heavy things, but he has a sweet personality and provides some laughs in the games. I had so much fun reading The Hunger Games. When a book can make me stay up late, even though I have to work early and know that no sleep makes me crabby, then it’s a good book. I can’t wait to jump into the next book in the series, Catching Fire, but I’m preparing ahead of time and reading it on the weekend so I don’t annoy my co-workers with my crabby self. Great review, LeAnn. Makes me want to read it all over again. I have part three preordered on Amazon! I loved the first and the second book. I have pre-ordered the third from Amazon too. I’ve heard there will be a movie out in 2011. I really hope they do NOT use Kristen Stewart as Katniss. I recently finished this, and agreeing with you on every word (yes, stayed up late to finish it even though I was very tired!! Nothing from 20.Apr.19 to 22.Apr.19.